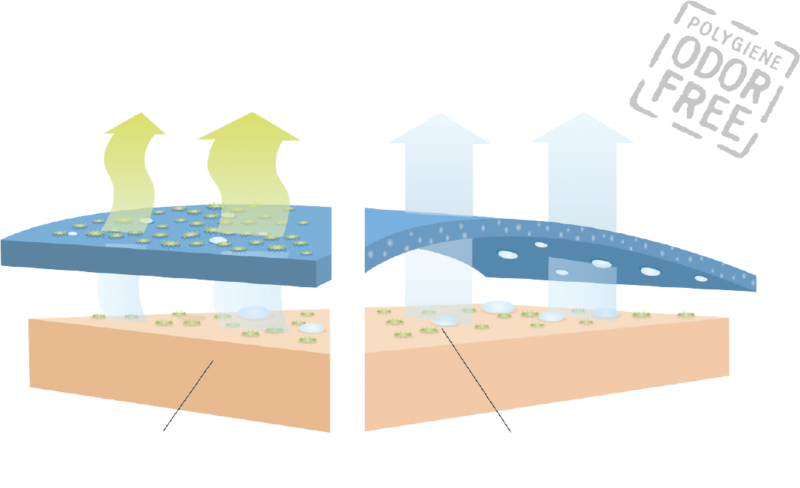 What are the benefits of Polygiene Odor Control Technology? Polygiene inhibits the growth of odor- causing bacteria for that fresh-all-day feeling. Odor develops when odor-causing bacteria settles into the fabric, mixes with sweat and multiplies. Polygiene helps prevent odor and prolongs the lifetime of clothing, footwear, gear and wetsuits, since the products are treated to resist deterioration by mold fungus and odor-causing bacteria. The treatment is permanent and effective for the lifetime of the product. Fibers live longer without bacteria and excessive washing, and treated products are not discarded prematurely due to odor. Polygiene particles have a large amount of silver ions per surface area. Due to the structure of the particles,very small amounts of silver are required for effective treatment. No interference with bacteria naturally occurring on the skin – Polygiene is active only on the material’s surface and does not interfere with bacteria naturally found on the skin, even when used for long periods of time1, 2. Tests also conclude that there is no identified risk from dermal and oral contact with silver treatments3.